This hotel is 100pct non-smoking Hampton Inn New Bedford-Fairhaven is the premiere lodging choice in Southeastern Massachusetts for both Business and Leisure Travelers. Business travelers enjoy our Hampton Inn hotel*s amenities and convenient access to numerous companies located in the Greater New Bedford Area including New Bedford and Wareham Industrial Parks. Leisure travelers appreciate Hampton Inn value and comfort when visiting local attractions quaint neighboring seaside towns and beaches. Hampton Inn New Bedford-Fairhaven is an excellent choice for guests traveling on to Cape Cod or taking the Martha*s Vineyard Fast Ferry. 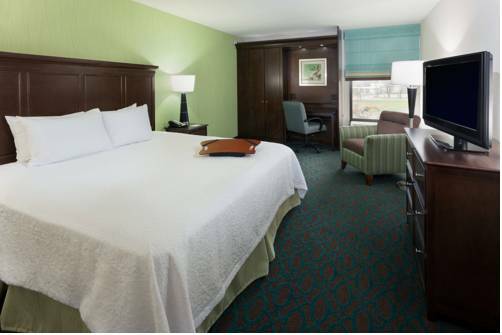 Hampton Inn New Bedford-Fairhaven features newly renovated accommodations including an inviting lobby 107 clean and comfortable guest rooms interior corridors elevators on-site fitness room outdoor pool and meeting space. Guest Accommodations At Hampton Inn you will find clean comfortable value-priced guest rooms offering Make It Hampton Amenities including u2022Cloud nine bedding u2022Complimentary high-speed wireless internet access u2022On the House Breakfast featuring hot items daily u2022Complimentary movie channel - cable television u2022Free local telephone calls u2022Coffee maker hair dryer iron - ironing board u2022Hampton signature radio/alarm clock for easy programming u2022Curved shower rods for ample shower space u2022Studio suites and full-size suites with microwave and refrigerator Additionally Hampton Inn hotel guests enjoy fresh baked cookies Sunday - Thursday a weekly welcome reception and 24-hour coffee and tea service. All reservations must be gtd with a major credit card or adv cash deposit to hotel regardless of time of arrival. All reservations must be cancelled by 11:59pm host time or cxl hour unless deposit required. policy is subject to change. Sit down restaurant known for their Calm Chowder and Lobster Rolls. Great food and martini bar.